This unit's short-range attack ignores cover. If this unit rolls three or more 6's on a short-range attack against a soldier or vehicle, the target is destroyed immediately. Aircraft and Obstacles are unaffected by this special ability. Q: Can a unit with the Flamethrower ability be used to attack Aircraft or Obstacles? Q: Can you use the Flamethrower ability as you make a defensive-fire attack? Q: Does the flamethrower's special ability trump the usual cap on defensive fire (max effect disruption only)? A: Yes. This falls under the "Abilities trump rules" heading (page 26). The flamethrower's special ability over-rides the usual defensive fire restrictions. Q: If a unit with the Flamethrower special ability rolls three or more 6s on its Flamethrower attack, does the target unit get removed from play at that exact moment or is a face-down Destroyed counter placed on it instead? A: The unit is removed from play immediately. 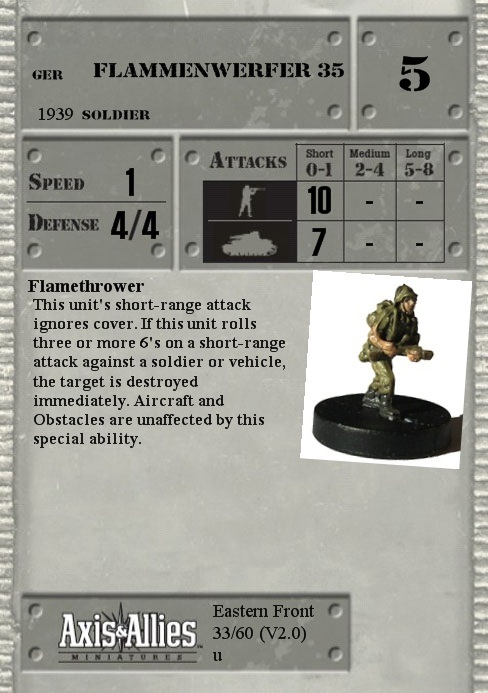 Q: If an attacking flamethrower unit is Disrupted or Damaged (in the case of a vehicle) the rules state that unit suffers a -1 to all attack dice. This would mean that the maximum a player could roll would be a five. Can that unit still use its' special ability? What if I have +1 to my attack dice? Would three fives be enough? A: Three 6s are three 6s, regardless of whether the attacking flamethrower has disruption, damage or has a +1 modifier. Only those numbers actually showing on the dice are considered. Modifiers don't matter.